Years ago, I was watching a Pixiwoo tutorial on YouTube and despite not speaking much, the young lady who was having her makeup done was simply magnetic. Naturally stunning and with a sweet smile that made you instantly warm to her, she left you wanting to know more - along with how she did her hair and what lipstick she was wearing! I came back to the video at a later date and scrolled down to the comments, instantly focusing on one in particular - Tanya has her own channel now too, it's called pixi2woo" - and that was it, that was how I first discovered Miss Burr and her videos. Now she's a Mrs and over the years that I've been watching her on YouTube, Tanya has grown into the most amazing woman and the huge achievements she's accomplished since have been a pleasure to witness. One of which is that she's currently the cover star of my favourite magazine, GLAMOUR, and holding her glossy article in my hands having been a viewer since forever left me feeling quite emotional in the best possible way - proud! Earlier this year I was interviewed by the BBC for a piece about vloggers from Norwich. They brought up Tanya and asked if I was a fan of her videos, to which I replied, "I'm wearing her individual false lashes, have three of her lipglosses in my handbag and am eagerly awaiting the release of her book!" They also asked why I think she's so popular, and the answer was easy; she's like a best friend. Tanya is authentically herself and you can't help but smile when you turn on one of her videos, her positive outlook on life is just infectious and she's so 'real', you know? You can relate to her in so many ways and I feel like I've definitely become more confident and happier in my own skin since I was a young teenager who'd just found Tanya's channel, and for that I'm so grateful. 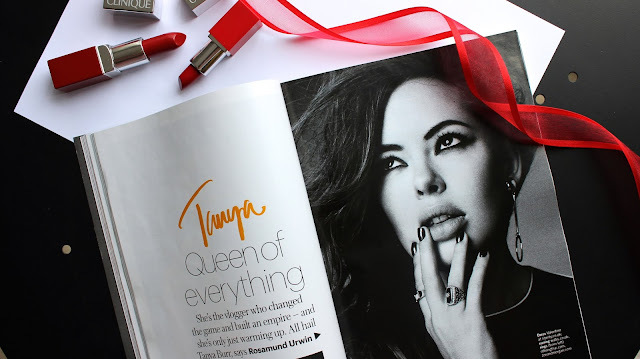 If you watched my Tanya Burr Cosmetics haul here and saw my review of her Christmas range here - as well as a few monthly favourites videos where I rave about her eyeshadows as they're simply the best! - you'll know how much I think that the intelligent, humble and beautiful Tanya deserves every good thing for all of her hard work. Reading her GLAMOUR article reinforced how highly I think of her as a person, and instead of rambling on about how far Tanya has come since the yellow sunflower wallpaper days (anyone else remember those?!) I'll just let you go out and get the magazine, as it speaks for itself and I for one can't wait to see what she does next.